How do I monitor pharmacy license changes? 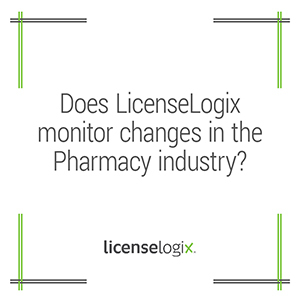 Yes, LicenseLogix monitors any regulatory and statutory changes in the pharmacy industry in all 50 states. LicenseLogix provides a service known as TRAC (Tracking Regulations And Compliance) which is a quarterly compliance report covering all 50 states as well as the District of Columbia. TRAC summarizes any recent pharmacy licensing law changes and processes being implemented by each state’s board of pharmacy. TRAC provides timely and crucial information on the status of licensing laws across the country. TRAC includes research and analysis of any changes to license processes and procedures, including changes to PDMP programs, controlled substance classifications and new definitions in the pharmacy code. TRAC research also alerts subscribers to any upcoming changes that have not yet been implemented. Additionally, if there is a change in the industry, TRAC will include the necessary forms and information pertaining to that change.